Longmont farmer Jon Hulme’s family may have a long history producing pine trees, but he’s betting his future on tomatoes. Seven varieties of the fruit – some yellow, some deep red, a few even green-striped, burst from the vines in one of Hulme’s greenhouses. Natural foods giant Whole Foods has already laid claim to Hulme’s first harvest of pesticide-free, hydroponically grown tomatoes, eager to feed consumer demand for local produce. In contrast, few were knocking on Hulme’s door for the trees, roses and other plants that traditionally called the greenhouses home. Hulme’s long-running nursery – Rocky Mountain Pines – was once the second largest evergreen seedling producer in the country, but the recession took a steep toll on the business. When the economy tanked, new home construction dropped, causing demand for landscaping to decline. A large commercial client went bust. To make matters worse, Hulme fractured his back, making it difficult to haul trees. Worried about his prospects, Hulme put the farm on the market. But instead of a buyer, he found a partner. Denver-based Circle Fresh Farms, which provides sustainable produce through a network of greenhouse farmers, scouted Hulme’s farm as a possible expansion site. When Hulme learned about the company’s model, he decided to trade pines for produce. 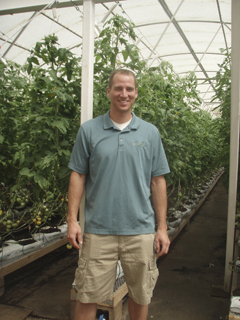 With guidance from Circle Fresh Farms, Hulme retrofitted his greenhouses, installing new heating systems that will allow him to grow year-round. Circle Fresh Farms works with local farms to grow sustainable produce in greenhouses rather than through traditional and weather-dependent farming practices. The company handles all distribution and sales so farmers can focus on growing quality produce. The vision for Circle Fresh Farms grew from a concern about current agricultural practices, which often result in food that has less nutritional value because it’s treated with numerous chemicals and is harvested too soon. In contrast, Circle Fresh Farms produce is picked fresh and delivered within 24 hours of being picked. “They’re really re-introducing tomatoes to people who have forgotten what a good tomato is really like,” said Kenny Mayer, Associate Produce Coordinator for Whole Foods in Boulder, Colo. Even more exciting, said Mayer, is that Circle Fresh Farms is helping to bring consumers unique types of tomatoes, such as the San Marzano Roma tomato, which is typically only found canned in Colorado. Hulme’s first harvest contains seven varieties of tomatoes, including the unusual looking zebra tomato, which is sweeter than its more conventional counterparts. Circle Fresh Farms’ model not only provides consumers with better quality food, but is better for the environment as well. That’s because produce grown hydroponically uses less water than crops grown outdoors in soil. Since hydroponically grown food doesn’t require soil, there’s also no need to use animal waste fertilizers, which can sometimes lead to ground absorption of toxic substances such as bacteria and even pharmaceuticals. But Hulme readily admits that growing hydroponically in a 40-year-old greenhouse isn’t easy. Luckily, Hulme said Circle Fresh Farms and its team of master growers, have been holding his hand the whole time, offering support and resources when a problem arises. In addition to guidance and sales support, Circle Fresh Farms also provides help locating funding to pay for greenhouse upgrades or new greenhouse construction. Hulme is one of five farms in Circle Fresh Farms’ budding network of Front Range growers. Naha said the company has identified 10 farms that are interested in joining the network, which includes farms in Denver and Pueblo. Before taxes, each 1-acre farm is expected to generate a profit of $186,000 annually. For Hulme, trading trees for tomatoes has given his 35-acre nursery a new lease on life. His business – now known as Boulder Fresh – is also growing cucumbers and plans to add other crops are if demand proves strong. In many ways, the farm’s shift towards produce is a return to its roots. Hulme’s wife’s family (which bought the farm in 1972), tried growing greenhouse-bred tomatoes initially, but when disease wiped out the crop, they turned to trees.